Today is the first full day of summer! But the season seems to already be in full swing, with lots of events to get your juices flowing for the summer!!!! 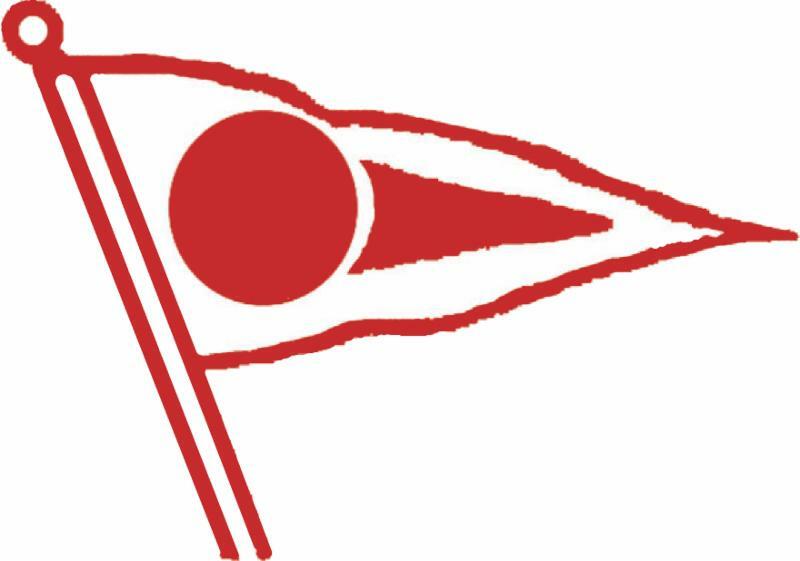 To start things off, the Commodore has a great PaBIA Tune Up Sailing Race to get ready for the season this coming Saturday! 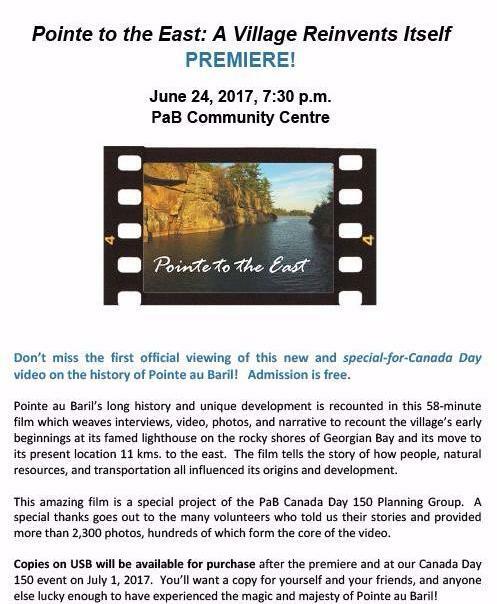 And don’t miss the PREMIER showing of the film documenting Pointe au Baril’s history from the late 1800’s to today which takes place at the Community Centre this Saturday! Many PaBIA members contributed to it! Check it out! Also, read about all the FANTASTIC activities slated for Canada Day 150 on the PaB Canada Day website….and especially consider the PaBIA sponsoredCryptic Clue History Hunt. Get your family and friends lined up NOW and, to be sure there is a place for your boat, register before July 1!!!!! 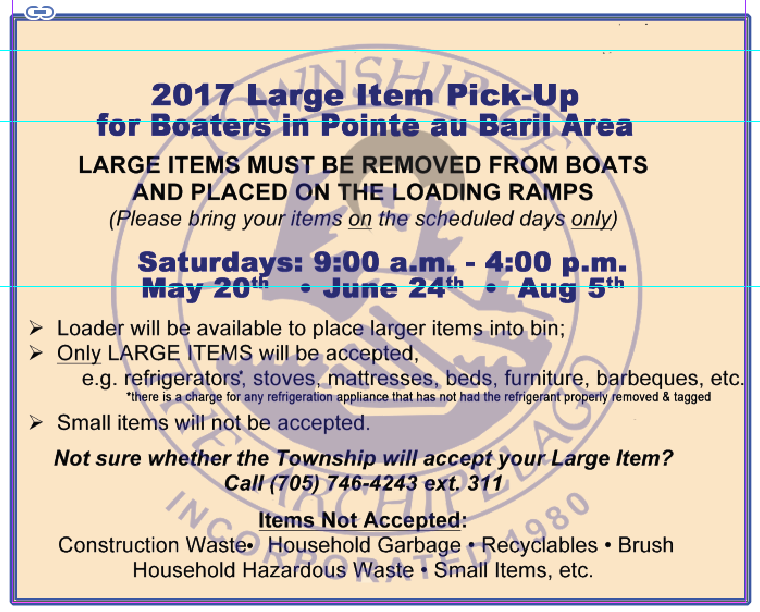 Think you know Pointe au Baril? Large Item Pick up June 24th! This Saturday, from 9 a.m. to 4 p.m., the loader will be on the government dock to take designated large items that you have removed from your property. Please read the ad in detail so you are aware of their requirements! 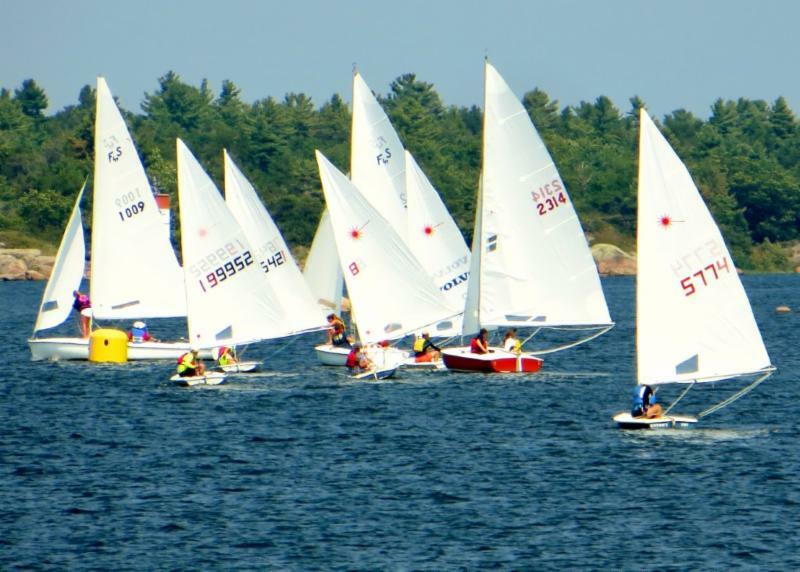 The Race Committee has ordered up sunny skies and 12 knot westerlies for the Tune-up Race being held this Saturday in Ojibway Bay. If you can’t make the start, be sure to at least finish with the Rendezvous hosted by Vicki and John Tremayne at A313. 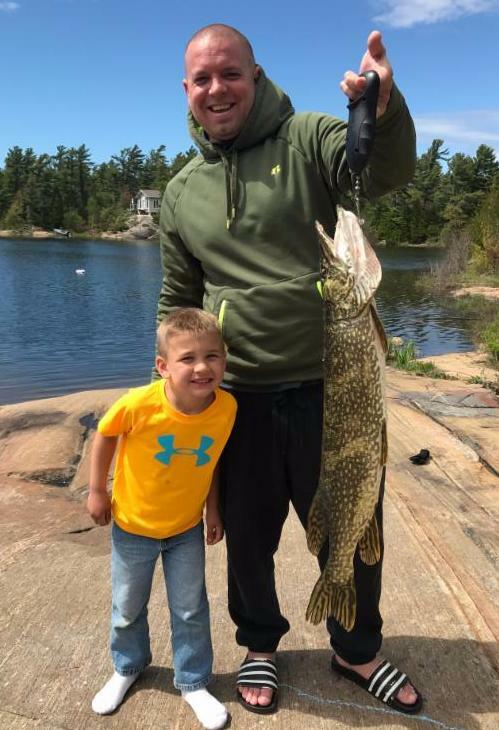 Don’t you love the spring when hopes are high and there is fun with the whole family to go fishing again. John Stuckey from St Louis, Missouri, and his nephew, Tyler Lewis from Concord, Ohio, created another lifetime fishing story. It has only been a couple of weeks and the fish continues to grow. Please take a second and share your 2017 Fishing Story with Dan Stuckey and the rest of the bay. Send your story and pictures to Dan Stuckey. The Ojibway Club invites everyone to their annual Entre Amis to be held this year a week later than usual due to the Canada Day 150 celebration at the PaB Community Centre! 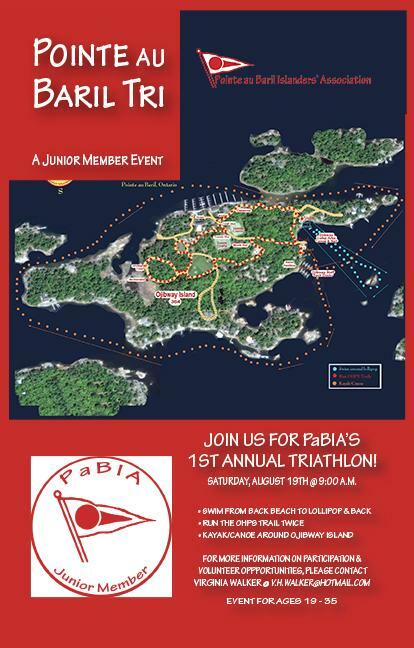 ALL PaBIA Jr Members – ages 19-35 – are encouraged to mark Saturday, August 19th at 9 a.m. on their calendars NOW for the 1st Annual Pointe au Baril Tri! This race, beginning on the Ojibway back docks, will include swimming, running and kayak/canoe paddling around the Ojibway Island! Prizes will be awarded!!! So please put August 19th on your calendar to be sure to be in Pointe au Baril for this amazing fun opportunity! All those participating MUST be PaBIA (Junior) Members between 19 and 35 years of age. SIGN UP TODAY! Question 1: Fire extinguishers and Garden Hoses – what do they have in common? Answer: They both can be effective in putting out a small fire. Question 2: Can you get to a fire extinguisher in less than one minute or a garden hose with the water on in less than two minutes? Do you have hoses already connected to an outside water valve and curled up and ready to go? Did you know? : 1) On most islands, you are only going to be able to save your island not the cottage; and 2) In most cases fires start while people are around and cause them. Answer: You can probably get the fire under control during this initial stage of that first one-two minutes that are most important both at home and at the cottage. It is just too bad no one makes decorator fire extinguishers so folks would hang them all over their walls. Question 3: How long does it take to get a fire pump going? Are fire pumps effective? Answer: Fire pumps work well IF folks know ahead of time how to operate it AND it is already primed and ready to go BEFORE a fire erupts unexpectedly. Have an island plan in place with each person knowing ahead of time what they should do in the case of a fire emergency. Our project to help build a new Habitat for Humanity home in Pointe au Baril has taken a giant step forward. The plot of land donated by Rob and Cathy Morel off North Shore Road will be ready for the building process in early 2018. Until then, the family selection process will start as will the design of the house. Habitat Ontario Gateway North will also start a fundraising campaign in Pointe au Baril. Help from islanders as materials, labor and funds will be needed to make it possible for the town and islanders to come together to help build a better life for a Pointe au Baril family. We had a very slight chance that Pointe au Baril would be one of the sites for a 150th anniversary Jimmy Carter build but land was not available for this year. Fortunately for Habitat Ontario Gateway North, there are four locations that are part of this anniversary build: Orillia, Huntsville, Espanola and Parry Sound. These four have all been given land for builds starting 2017. Congratulations to these communities as they will be better communities because of these efforts. Parry Sound, which has a Habitat affiliate and a small staff, will be our building partner for our 2018 build. They will help us through the family selection process and be a part of our engineering and site management. To help us get started, the Parry Sound affiliate has invited Pointe au Baril residents and islanders to help them with their build this summer on Addie Street, July 10th through July 14th. The building will continue beyond that week but this is their “Carter Blitz” where many will be welcome to lend a hand. Please spread the word and plan on spending a full day or two on the site during this week on the site. If you are unable to pick up a tool and help, stop by and check out the action. Pointe au Baril will be doing the same thing next summer. 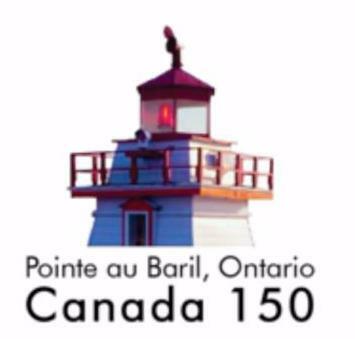 Pointe au Baril residents and the islanders need to make a modest cash donation to offset the cost of promoting our Pointe au Baril build for sign printing, tee shirts and more. More details will be coming out shortly from Habitat Ontario Gateway North. For now, plan to join in the Parry Sound action and please help support the promotion efforts. To the friends and families of those whose deaths have been reported to us since the 2016 Yearbook, we extend our deepest sympathy. If we have not included the name of any deceased member, we are sorry. 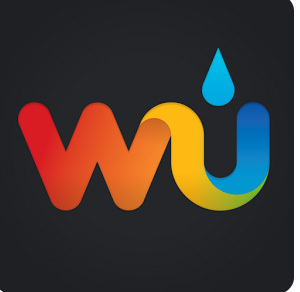 Your help in keeping us informed is greatly appreciated. Nancy Bush, G1236 ‘Loon Cove’, mother of Michele (James) Sober, March 2017. Joan McCrodan, (nee Thomas), past PaBIA membr, B824 ‘Seven Acres:”, wife of John, mother of Cathy (Dan) Atkinson, David (Carole) the late Christopher, Peter (Andrea), James (Patty), Andrew (Judy), June 2017. Ruby Reid, past PaBIA member, A510 – 50, former owner/operator of Reid’s Marine and Ward 1 Township Councillor, wife of the late Wallace, mother of Fred (Mary), Sue (John) Gaw, June 2017. Grace Wright, past PaBIA member, M52, Pointe au Baril resident, wife of the late Art, mother of Mary, Judy (David) Snider, John (Iona), May 2017.